We picked up some of the Pigeon series books by Mo Willems from the library. Both the kids LOVE them. Most definitely recommended!!! Have you heard about Mo Willem's chalkboard dining room walls? Also, discovered a related website today called Pigeon Presents! We learned that Pigeon's birthday is April 1st and that his favorite food is hot dogs! my kids LOVE and ADORE Mo WIlliams books! Our family is big Mo Willems fans also. It looks like he's working on a cat character book (according to his blog). Very exciting. Hope you're feeling better soon. Oh, wow! This post really hit me today. Yes, it's a cute picture, but it's a lot more than that. My husband died last Thursday. Ever since the age of 12, he had bred, trained and raced homing pigeons. I posted about him yesterday and today. Previously, though, I had posted about the pigeons. What a fantastic photo. I hope my boys like to read when they are able. I haven't heard about the chalkboard. I'll have to check that out. Hope you're feeling better!! Cute picture! We've checked one of those out at the library... They are cute! We just read a Pigeon book tonight. We love all the Pigeon books. My kids have become big Mo Willems fans. I haven't read the Pigeon wants a Hot Dog yet - it's never in our local library. Very cute photo! 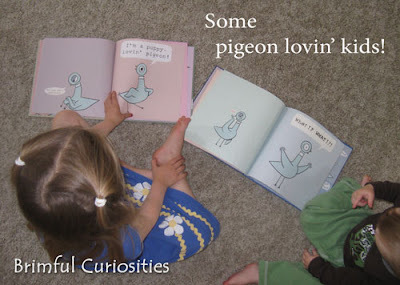 We love the Pigeon books around here too! Such a cute shot! Love Pigeon series books too! Have they read the pig and elephant by Mo? So cute. My boys love them! !